Home to a medley of international cuisines, highly-acclaimed chefs, first-rate seafood and compelling landscapes, choosing the right place to eat in Victoria, Vancouver Island can seem like an impossible task. 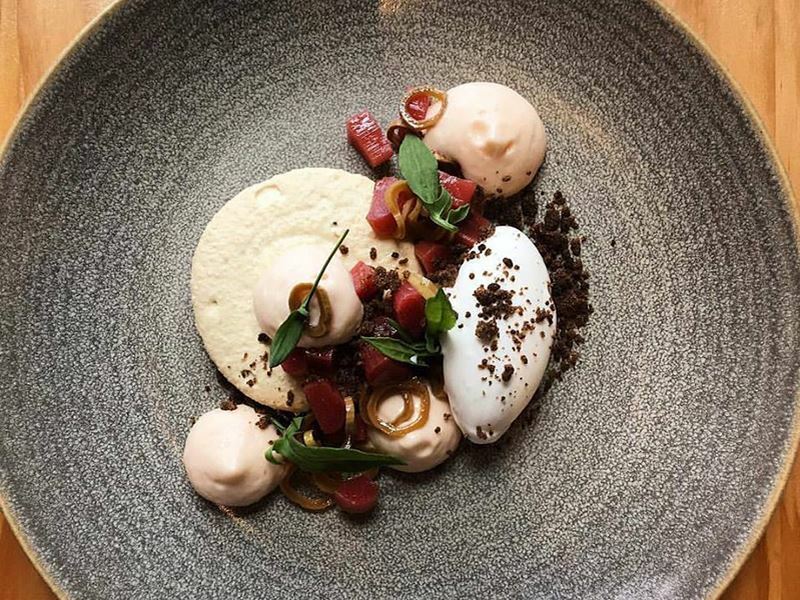 So why not make things easy for yourself and take the pressure off by choosing somewhere from our pick of the top 10 fine dining restaurants in Victoria? Each has been carefully chosen for their striking settings, exquisite menus and exemplary service, perfect for cosying up for a romantic date night or celebrating a special occasion. The scene: Perched at the top of the Chateau Victoria Hotel, Vista 18 showcases the true beauty of Vancouver Island. The incredible views can be seen from every table (there really isn’t a bad seat in the house) and stretch from the ocean to the mountains, much like the menu. Offering a broad selection of modern American and Canadian dishes, from steaming seafood hot pot to waffle-encrusted slow-roasted chicken thigh, the enticing menu is so extensive that it’s bound to have just what you’re looking for. For lighter bites, there’s also a tapas-style menu available at the wine bar, comprised of an international plethora of small nibbles designed for sharing. The live jazz band which plays on Friday and Saturday evenings adds a lively buzz to the place, making Vista 18 equally perfect for tucking into a plate of sous vide duck breast or sipping on one of their creatively named signature martinis. Signature dish: Vista 18 signature root vegetable crisps served with a black garlic tzatziki. 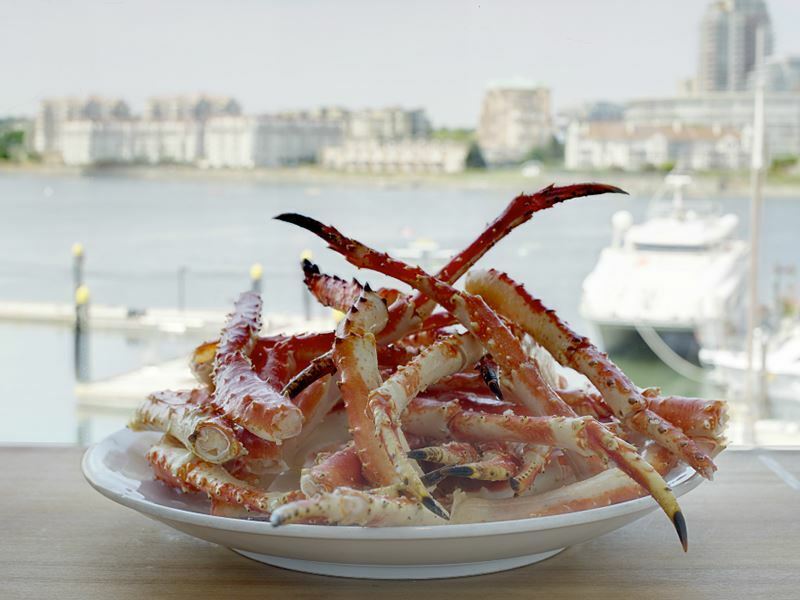 The scene: Boasting floor-to-ceiling windows with sweeping views of Mount Baker and the Straits of Juan de Fuca, Marina Restaurant serves up a feast for all the senses. 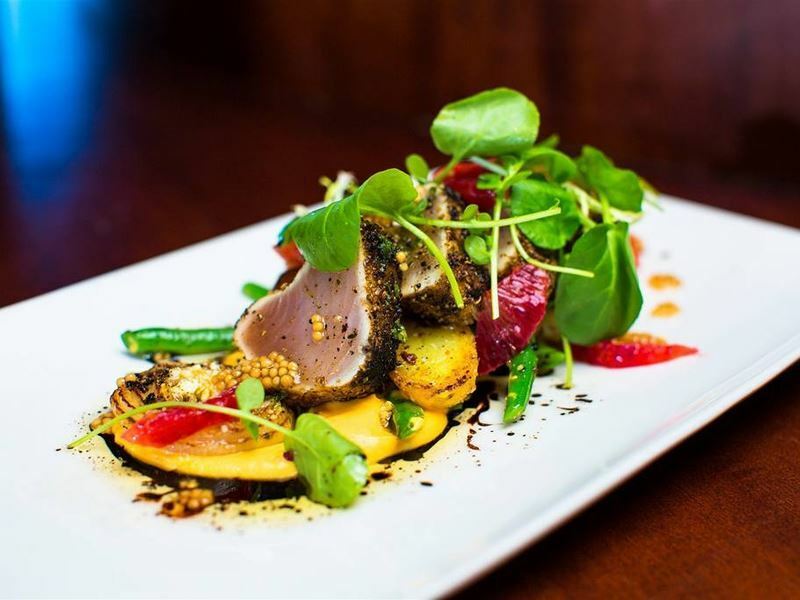 The award-winning restaurant is best known for its regional cuisine and offers an enticing dinner menu laden with local seafood, such as pan-seared salmon with shaved fennel and poached halibut with buttered mashed peas. All fish and seafood dishes are 100% certified Ocean Wise, so you can feel good, knowing you’re doing your part to support the marine ecosystem with every order. Keen to offer something for all palates, Marina Restaurant’s menu also features a handful of creative meat-based options, like herb-marinated ribeye steak and pecan chicken with peaches. For an extra gourmet experience, head for the sushi bar and choose from a huge assortment of typical Japanese-style sushi (maki, sashimi, nigari, inari and bento) and American-style sushi, including various tempting rolls and bowls. Signature dish: Local catch of the day served with organic vegetables, honey-roasted beetroot puree and papaya salsa. The scene: Described as ‘the best seafood spot in Victoria’ by Frommer’s International Guide, Blue Crab Seafood House makes the most of seasonal ingredients to create an exciting menu, brimming with tantalising dishes that change throughout the year. This downtown gem features a cosy indoor dining room with a dark, romantic colour scheme as well as a dazzling outdoor terrace with mesmerising harbour views, making it the perfect spot for an amazing date night you’ll never forget. In addition to the dinner menu which features drool-worthy mains such as blue crab risotto with chilli oil and Dungeness crab with drawn butter, Blue Crab Seafood House also offers fantastic daily specials hand-written on a rustic blackboard. The wine list highlights crisp Pacific Northwest and British Columbia labels that pair perfectly with the fresh-daily seafood, while the made-in-house desserts are the ideal way to round off your meal with a small indulgence. Signature dish: Crab cakes served with napa cabbage and fennel slaw, drizzled with chili aioli. The scene: Providing an inviting escape on the edge of Downtown Victoria, AURA Waterfront Restaurant + Patio evokes feelings of culinary excitement the minute you walk through the door. The kitchen dream team work hard creating menus that are both a real labour of love and based on fresh, local ingredients that evolve throughout the seasons. 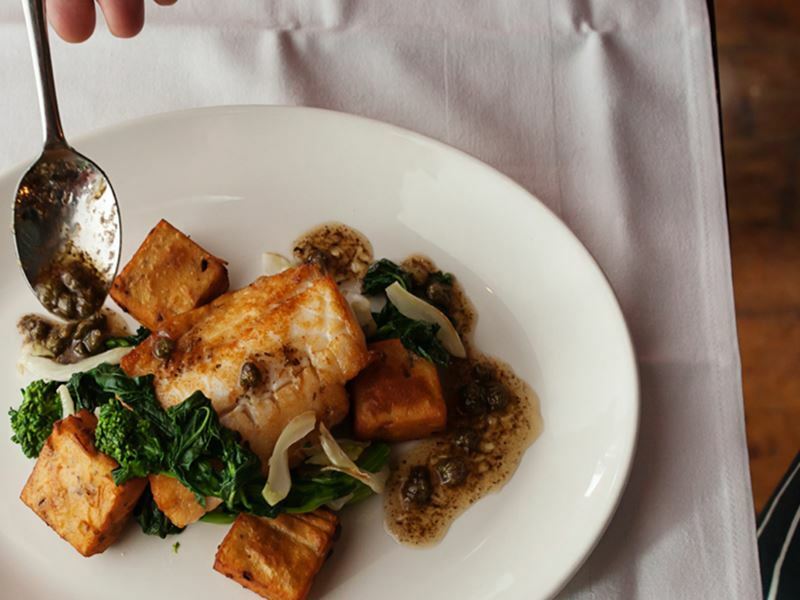 Exhibiting the finest in local seafood, the dinner menu includes delights such as fresh B.C. oysters, banana leaf-wrapped halibut and deep-fried sushi. You’ll also find some decadent meat-based options to satisfy ravenous carnivores, too, such as pork two days (glazed loin and sous vide belly) and five spice-rubbed duck breast. 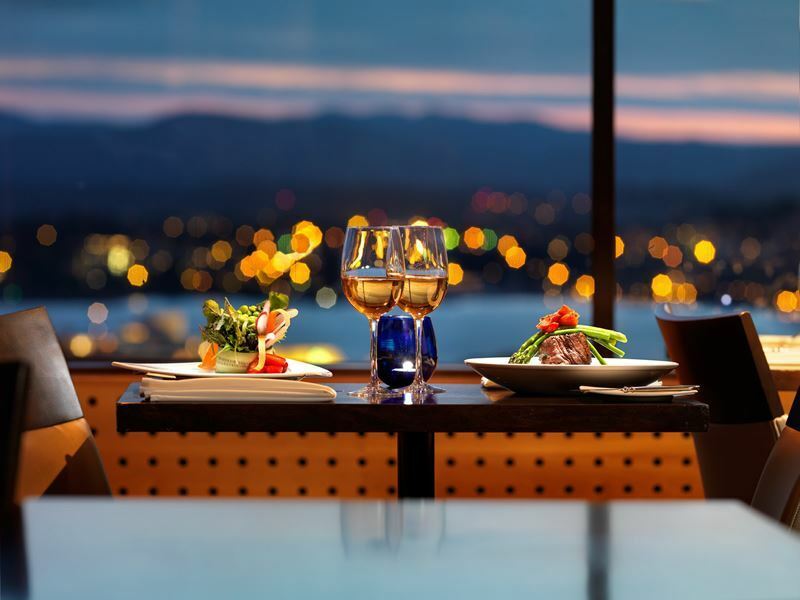 Despite being a fine dining restaurant, AURA’s lack of a formal dress code and chic, contemporary environs give it a casual, laid-back atmosphere, making it perfect for foodies who want gourmet eats without a stuffy atmosphere. Signature dish: Seafood Trio – seared scallops, local wakame butter-poached spot prawn tail and karaage head, and charcoal grilled octopus with pommes dauphine, baby summer vegetables, dashi glee and nasturtium velouté. The scene: Serving up classic fine dining with a fresh modern twist, Q at the Empress imbues royalty and decadence everywhere you turn. 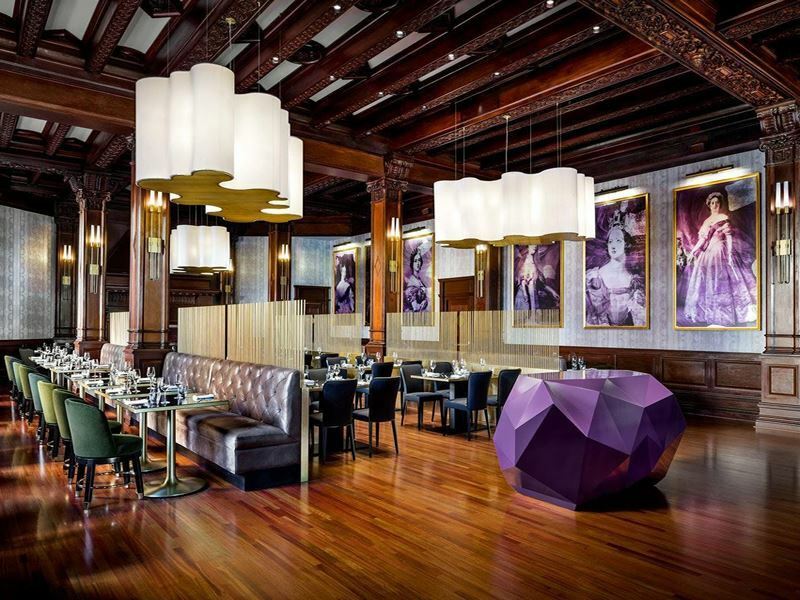 From the luxurious plum-coloured artwork and seating to the tall, ornate ceilings and the wonderfully artistic low-hanging chandeliers, you know you’re in for a real treat before you even sit down. 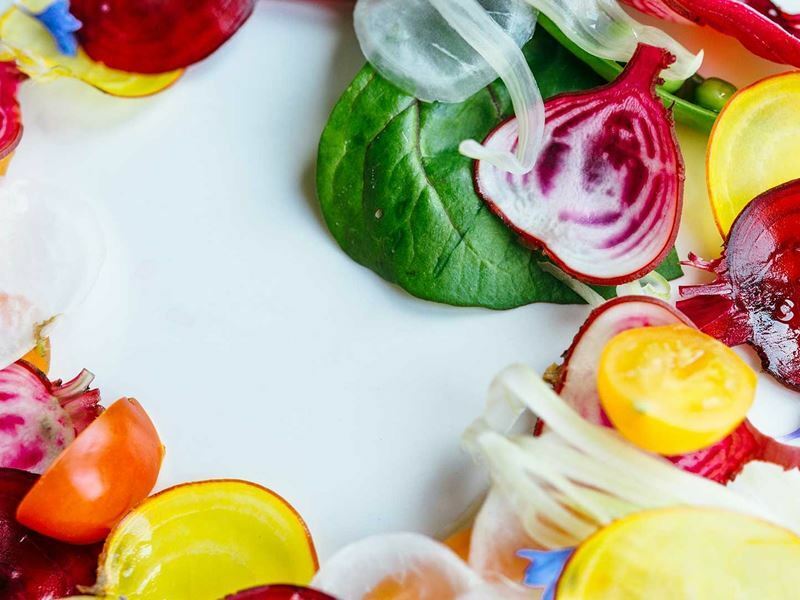 The cuisine is best described as Pacific Northwest, with a strong focus on seasonal produce and ingredients sourced from local artisans and farmers, all complemented by delicate herbs and vegetables grown in the chef’s onsite garden. Light bites, such as the seafood tower for two with Dungeness crab and tuna poke, develop into more hearty offerings, like slow-cooked double pork chop with carrot cumin puree and roasted Kuterra salmon with whipped potatoes, as the menu progresses. Although the wine list is superb, you’ve got to try the Empress Signature Cesar cocktail, made with Finlandia vodka and house clamoto, decorated with a charcoal salt rim. 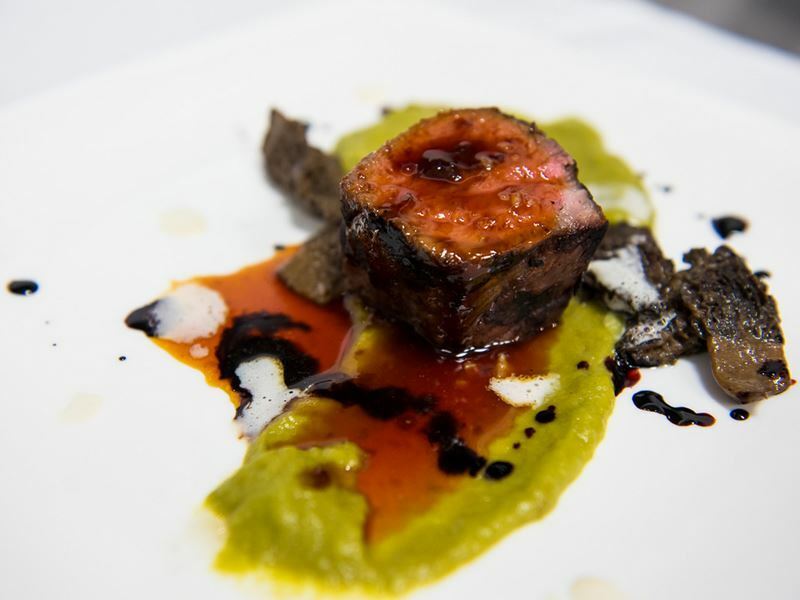 Signature dish: Roasted Peace River lamb loin with charcoal aubergine, thyme potatoes and Kalamata liquorice crumbs. The scene: Oozing exclusivity and unashamed luxury, the Mark is a private dining room set inside the distinguished Hotel Grand Pacific. Offering a one-of-a-kind blend of total privacy and dynamic Pacific Northwest cuisine, this clandestine dining spot flaunts perfectly dressed tables, complete with custom-blown candles, Frette linens and Riedel glasswear, leaving no detail forgotten. The relatively small menu starts simply with fresh salads, daily-prepared soups and small nibbles like crispy calamari and pork belly steamed buns, before moving onto more robust fare, such as house-made pizzas, Asian-inspired ramen bowls, gourmet burgers and a great choice of fish and meat dishes. Even though the relaxed style of cuisine is not what you might expect from a fine dining restaurant, the exceptional effort that goes into creating each dish and the impeccable presentation suggests otherwise. The extensive wine list, which has seen the unique dining spot receive the Wine Spectator Award of Excellence for the past nine years running, is sublime and worth the price tag. Signature dish: Grand Pacific Burger – a grilled gound chuck patty topped with ancho chilli barbecue sauce, aged cheddar cheese, onion jam and lettuce in a brioche bun. The scene: A classic French-style bistro that serves simple, hearty cuisine along with excellent wine and beer, Brasserie L’ecole is a pleasantly cosy restaurant that strikes a harmonious balance between a casual dining place and an epicurean spot in which to enjoy great food and flawless service. The menu changes constantly to capture the essence of seasonal highlights, like heirloom tomatoes, salmonberries and figs, but always offers a decadent combination of rich and flavoursome French country cooking. If you really want to tuck into something special, don’t pass on the signature platter for two which is always a fabulous sharing experience. The patina-rich fir floors and the pastoral chalkboards listing today’s specials add a homey feel, enhanced by the low lighting and limited seating capacity. Just be prepared for a bit of a wait, as the petite dining hotspot doesn’t accept reservations. Signature dish: Despite the nightly-changing menu, steak frites with a red wine and shallot sauce is always available and reliably heavenly. The scene: An organic farm-to-table dining venue with a love for real, honest food, OLO Restaurant focuses on creating a menu and environment that promotes sharing fresh, tasty food with friends and family. The name OLO means ‘hungry’ in ancient Chinook jargon, a language used by the earliest settlers of Victoria, and was chosen because it connects with the way the chefs honour their ancestors’ traditions by preparing beautiful food with ingredients sourced directly from mother nature. The main dinner menu is comprised of a taste bud-tantalising choice of contemporary Canadian eats, such as flat iron steak with potato rosti, chicken duo with mascarpone tortellini and seared ling cod with crushed new potatoes. But for the best experience possible, you’ve got to go with one of the tasting menus, brimming with the chef’s choice of the finest dishes available that day and a gorgeous dessert. The optional wine pairing comes with a small extra charge and has been carefully chosen by the in-house sommelier expert to perfectly complement each dish. Signature dish: Duck breast with herb doughnuts, green onion, cabbage and a blueberry sauce. The scene: Offering fine dining food in a casual urban setting, Saveur Restaurant specialises in French-inspired contemporary cuisine delivered in the form of an elegant a la carte menu and playful tasting menus. 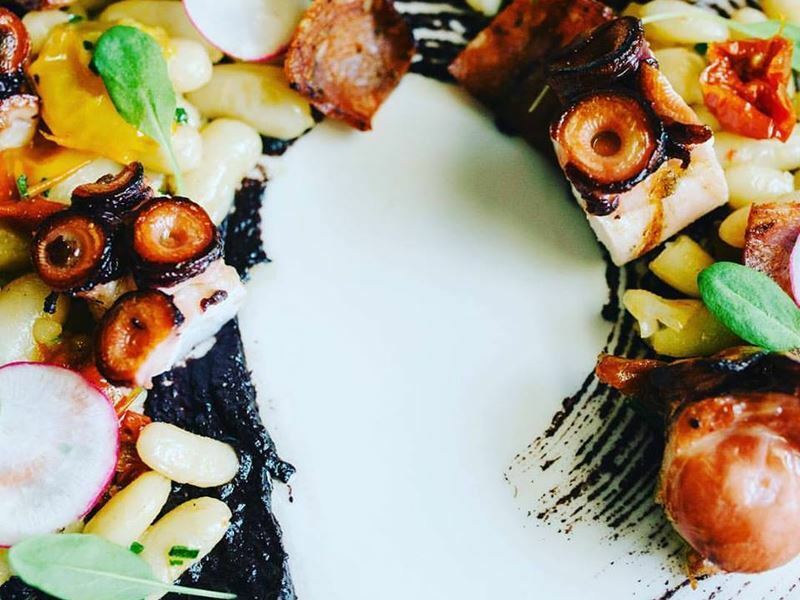 Placing great importance on local ingredients and working closely with local farmers, foragers and fisheries, award-winning chef Robert Cassels is brazenly proud of his tasting menus and recommends them to all diners. Available in standard and vegetarian options, the tasting menus change seasonally and feature four savoury dishes plus one sweet dessert. 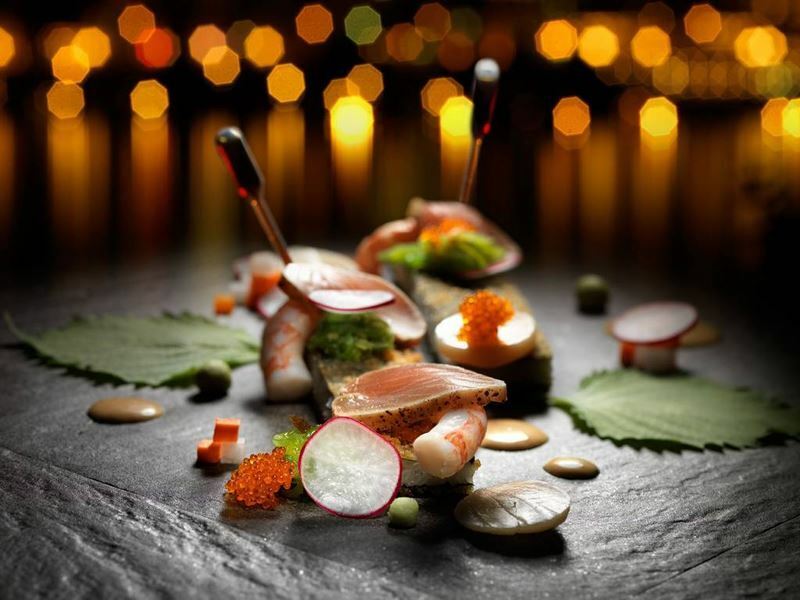 With decadent delights such as Sockeye salmon with black garlic brioche, veal striploin with crispy sweetbreads and loganberry marshmallow with white chocolate, these small plates of artistically-prepared cuisine will invigorate all your senses as soon as they’re placed in front of you. To avoid distracting diners from the gallery-worthy dishes, the décor is kept minimalistic, with barefaced black brick walls, contemporary artwork and a basic colour scheme creating a blank canvas for the stimulating dining experience that awaits everyone who pulls up a seat. Signature dish: Because of the ever-changing nature of the tasting menus, there’s no signature dish. The scene: Self-described as ‘slightly finer dining inspired by land and sea’, 10 Acres Kitchen goes back to basics in the best way possible. Whatever the kitchen team doesn’t grow and ethically raise themselves on their organic farm in North Saanich, they selectively source from like-minded farmers, fishermen and food purveyors as locally as possible. Their regionally-inspired Pacific West Coast menus headline the freshest and most innovative ingredients available, guaranteeing you bursts of incredible flavour with every mouthful. The a la carte menu offers beautiful small and large plates, with outstanding menu items that read like poetry. The Chinook salmon with house-made ricotta, smashed peas, grilled sourdough bread, pickled blackberry puree and lemon butter sauce being just one of the many examples. Weekly-changing five-course tasting menus, brimming with an enticing amuse bouche, salad, pasta, main and dessert are the best way to take full advance of the chefs’ creativity and their unparalleled access to superior quality ingredients. Signature dish: Local Dungeness crab served steamed or chilled with roasted potatoes and 10 Acres Farm vegetables.